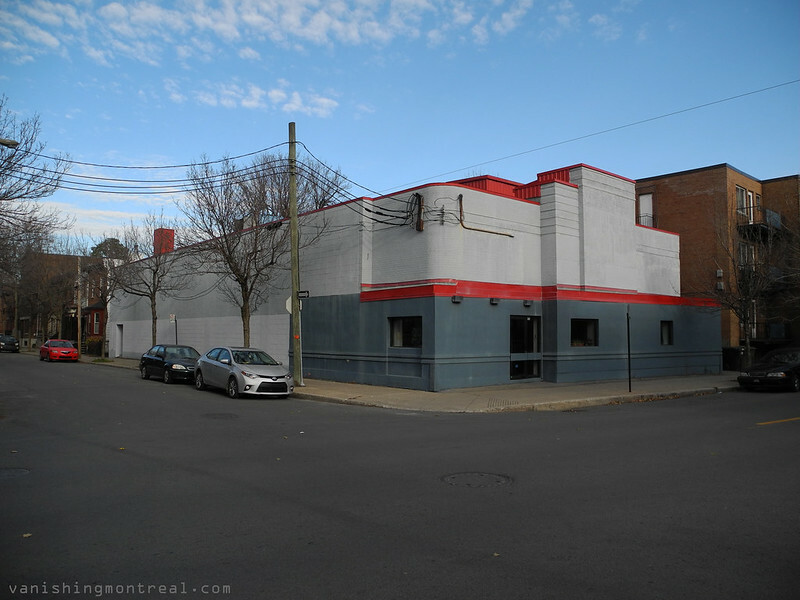 Cool retro building on Charlevoix street in Pointe-Saint-Charles. Looks like an old movie theater. Bâtiment rétro cool sur la rue Charlevoix à Pointe-Saint-Charles. On dirait une vieille salle de cinéma. My guess is that it was actually a garage. It used to be the Vogue Theatre a little before my time but I did get to see a few Bruce Lee movies there. After that it became a recording studio for the likes of Celine Dion and Rene Simard. I fondly remember pelting Rene with eggs and tomatoes as he came and went from the studio! Thanks Garry for the info! I have to look up more on the Vogue Theatre. Your welcome,great site by the way! my father was a street photographer for years and gravitated around the "Taverns" in the Point as well as St.Henry.Sadly we lost all of his equipment,photos and negatives in a house fire. my dad was never the same after that tragic night. I have yet to see anyone document that part of our past.Keep up the great work you truely are providing a very important message in your images, a few tears as well! What a sad story there. I can understand your dad's feelings. Thanks for your generous compliments. That absolutely is the old Vogue theatre, We used to watch 3 movies in a row for 99 cents I think it was. I also think they had the same hotdog turning on that rotiserie on the counter for years. Why would anyone buy a hotdog on a spit in Montreal of all places where you could get a steamie or a toasted hotdog on every corner almost. In the 60's the place was fairly run down,but as kids we liked the movies. ps: I think I have a different shot of the Vogue around somewhere,if so I will fire it off to you,again keep up the good work it is appreciated. Rather than search through some of my external hard drives, I found this site showing a photo of the Vogue & sharing information about it in general.